Although Jenna Johnson’s Washington Post piece described Governor Martin O’Malley as “brusque…terse and often lack(ing) patience” during a Board of Public Works meeting, that meeting still netted Dominion Resources another small step toward investing $3.8 billion into upgrading their Cove Point facility by allowing them a tidal wetlands license. O’Malley joined Comptroller Peter Franchot and Treasurer Nancy Kopp in approving the permit, leaving only federal authorities in the way. The permit was for a temporary pier to offload construction supplies for the project, which environmentalists fear will lead to further extraction of natural gas in the region for export. To me, it wasn’t a vote O’Malley wanted to take, and he really didn’t have to – his vote against would have only made it a 2-1 decision. But to do otherwise would have left another black mark on his administration’s legacy of making Maryland one of the states most unfriendly to business in the nation, even though the permit would have gone through. And it’s not like environmentalists aren’t winning the war despite losing that battle – the prospect of fracking in Western Maryland is growing dimmer by the day given some market saturation and the outlandish regulations proposed for drilling – never mind the possible benefits that would bring. 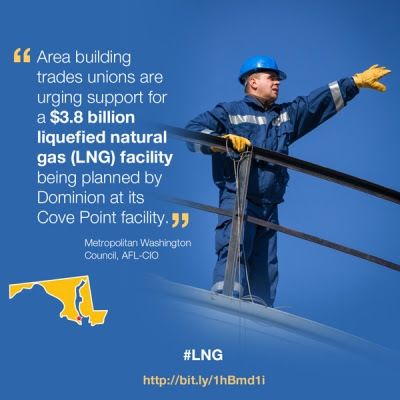 But O’Malley had to disappoint the few hundred who are passionately opposing the remodeling of the LNG terminal in Calvert County. At this point, though, it’s all about promoting the legacy and let’s face it: are the environmentalists going to vote for Larry Hogan? Well, there is that slight possibility but when the Washington AFL-CIO and other trade unions support Cove Point, O’Malley can’t afford to alienate that group. That’s hundreds or even thousands of motivated voters he has to keep in the Anthony Brown camp. So Martin O’Malley will hold his nose and vote for Cove Point, all the while hoping that his buddies at the EPA or somewhere else in the federal government will bail him out by turning thumbs-down on the project at a late stage. After all, if they can stall the Keystone XL pipeline for this long, pushing back a project just a few miles outside Washington, D.C. is almost a no-brainer to them. So when Martin O’Malley acts like a petulant child in a meeting because he knows he has to take an unpopular vote, we shouldn’t feel any sympathy for him. He’s left a whole lot on the table insofar as benefiting from our American energy boom goes and he knows it. Change Maryland has released new information that seems to reveal the appearance of a “pay-to-play” system within the O’Malley-Brown Administration where contractors received significant benefits from the state either before or after their donations to the Democratic Governors Association during Governor O’Malley’s tenure as its chairman. “This additional data further suggests a disturbing pattern of behavior that, at the very least, is unethical and inappropriate,” said Larry Hogan, Chairman of Change Maryland. “I think the public has a right to know the truth about these practices. Did the governor and/or others in his administration solicit large contributions from contractors, then reciprocate by rewarding those donors with huge state contracts, contract extensions, or other special favors or decisions in return?” he added. Obviously this has serious implications and gives the appearance of the potential for decisions being influenced by millions of dollars in “donations.” Recognizing the inappropriate and unethical nature of these relationships, state law currently prohibits state contractors from making contributions to an elected official’s campaign account. This evidence indicates the possibility of a deliberate, coordinated effort by this administration to circumvent the intent of the law by soliciting huge, unlimited contributions to a federal, rather than state, account. The report released today by Change Maryland shows that healthcare services company Express Scripts received a $2.3 billion contract despite serious concerns about the company’s legal issues in Maryland and 28 other states. In 2008, the company paid over $9.3 billion in settlement costs to these states. From March 2011 to February 2012, the Maryland Board of Public Works was deciding whether to approve the lucrative contract to Express Scripts to provide prescription drug services to state employees. In March 2011, two of the three members voted to postpone a decision out of concerns about the company’s legal issues and several flaws in the procurement process. Governor O’Malley was the lone vote to move forward with the contract. During this same time, Medco – a company looking to merge with Express Scripts – donated a combined $225,000 to the DGA. In fact, their first contribution came just six days after Governor O’Malley cast the lone vote to move forward with the drug contract. In late January 2012, the Board of Public Works again voted to delay the contract award, drawing significant criticism from Governor O’Malley at the time who complained about the endless delays. One month later, the BPW reversed course, awarding the contract to Express Scripts in a two to one vote. On March 27, 2012, Medco made their second and final donation to the DGA: $125,000. Medco and Express Scripts received final Federal Trade Commission (FTC) approval for their merger on April 2, 2012. In addition to this most recent research, Change Maryland released other questionable contributions from state contractors to the DGA. Update: I was informed by a representative of Express Scripts that the correct settlement figure is $9.8 million (not billion.) This is incorrect in the original Change Maryland release, so I left the release as is and opted to clarify here. Hogan’s group seems to be taking the Chinese water torture approach, leaking information on this report a drop at a time to both make the opposition wonder what else he’s got and keep up interest in the runup to the release. This series seems to leave me torn as well. I’m an advocate for unfettered political contributions, even at the risk of these apparent pay-to-play contributions. But I also want full and relatively instant disclosure, and even though these are federal releases with a more aggressive reporting schedule than state accounts – at least in non-election years – there’s still a significant lag time involved. What I’m afraid of is that this Change Maryland report will be both the tip of the iceberg and dismissed as “old news” because Martin O’Malley isn’t running for anything in Maryland and Anthony Brown will escape culpability because Larry Hogan is now a political opponent instead of an honest broker. We need to clean out the swamp, it’s true, but in order to clean it we have to secure the tools to do so first. I think it would also be a good idea for Change Maryland to reveal where it gets its funding, just to show leadership. That’s my two cents.